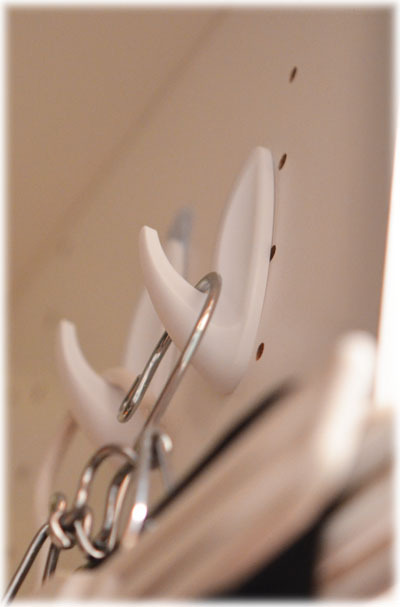 I used the stick on hooks and placed them on a little wasted space (according to directions which come with the hooks –very easy to do). I did two since I had 2 pair of boots to deal with but I could have probably gotten 4 if I had placed some below in another layer. I just held the first pair against the wall to see where the second hook needed to go. Then I clipped the boots onto the hanger and hung them up. Easy! I think the whole project took me less than 15 minutes. And it’s nice to have my boots hanging up out of the way and I know that they won’t get damaged or stepped on or forgotten when boot season comes back. The only real difficulty was getting a good photo, but I think you can see what I did in this series of shots. On the subject of organizing and those little stick on hooks, I used them on the inside of my pantry door to hang a lot of my little odds and ends like measuring spoons and cups and hot pads. It saves me a couple of drawers and space is at a premium. They really are a space saver! 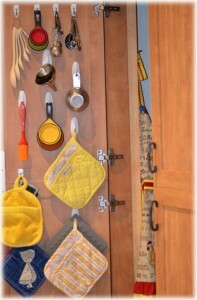 I put them up after I got my cabinets refaced and replaced the louvered doors on the pantry. It’s so nice to be able to put my hands on my tools! I think organization makes such a big difference when you’re working on any kind of project. OK, so I think I’ll head on over to Handmade Monday and see what everyone’s “cooking up” over there. I know they always have some lovely things and some good ideas. Just click on the link and go blog hopping. A really natty idea. Thanks for sharing. 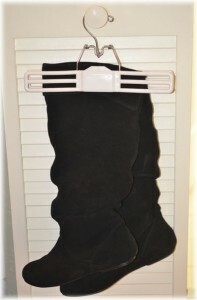 A great idea for the boots. Get fed up with them being constantly creased where they just naturally fall over. Hope you have a good week. Exactly, they do get creased because they will not stand up! This should take care of that as well. Now you’re making me laugh. Thank you but…no, I’m not really. However, I do try to be. Thank you all. And, I hope to be here next Monday but we are preparing for a potential Hurricane (Isaac) who is out there in the Atlantic as we speak with his eyes on us! I hope he heads back into the Atlantic and bothers only the fish, but we shall see. what a great idea, you can never have too many hooks! Very simple but clever idea. I have all my gadgets in the kitchen hanging up but never thought to incorporate it into bedroom storage.Thanks for the info. Easy peasy when you know! Hugs Mrs A.